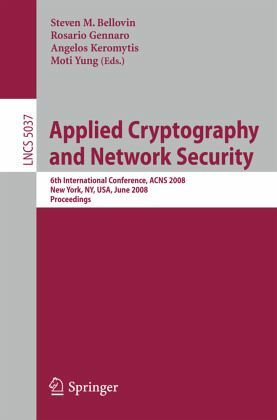 This book constitutes the refereed proceedings of the 6th International Conference on Applied Cryptography and Network Security, ACNS 2008, held in New York, NY, USA, in June 2008. The 30 revised full papers presented were carefully reviewed and selected from 131 submissions. The papers address all aspects of applied cryptography and network security with special focus on novel paradigms, original directions, and non-traditional perspectives.